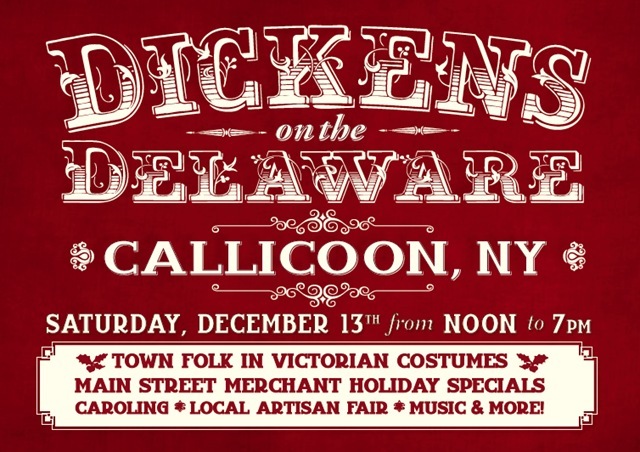 CALLICOON, NY (December 8, 2014) – The inaugural holiday event Dickens on the Delaware will showcase the retail community in the picturesque hamlet of Callicoon on the Delaware just in time for your Holiday shopping. Retailers, galleries and restaurants will highlight their Holiday goods and dazzle town visitors with their Holiday Spirit. Shopkeepers will be dressed in Victorian garb, with stores, restaurants and the surrounding environs decorated to create the days of yore. Callicoon will be transformed into a Christmas wonderland with Christmas trees and festive wreaths. Strolling carolers, along with stations set up throughout the town, will encourage visitors to explore all streets and byways. A photo studio, featuring a Victorian Parlor, will provide opportunities for memorable Holiday portraits by a professional photographer. Visitors can also keep warm at the Hot Chocolate Station, as they enjoy Live Opera. Local artisans will feature their works by the roaring fire in the Victorian Western Hotel. Callicoon retailers will all stay open until 7PM to highlight the beauty of the historic town in the evening, where town visitors will be able to warm their hands by outdoor fire stations. Wine, eggnog and hot chocolate will help get visitors into the holiday spirit of gift giving. Venues will include a Gift Wrapping Station, Mulled Wine and Potato Pancake station and music throughout town. The classic Frank Capra Christmas Film “It’s a Wonderful Life” will be projected on the coal silos as “town folk” dressed in Dickensian outfits stroll about. A memorable experience awaits patrons from Narrowsburg, North Branch, Jeffersonville, Damascus, Barryville, Livingston Manor, Honesdale and other surrounding communities. Event Continues On Sunday December 14 from 11 a.m. – 5 p.m.
For details and more information e-mail: callicoontrading@gmail.com or call 845-887-9017.